When Daddy and I got married, 13 years ago, our friends and family were very generous with their gifts to us, amongst the usual things that you seem to find given as a gift at weddings, we were gifted gift vouchers to enable is to buy several of our favourite and much needed items for our first home and my parents got Daddy and I a fridge. The fridge has served us well over the last 13 years, however. All good things, must come to an end and it was earlier this Summer that we started investigating new fridges, realising that ours was on it's last legs. 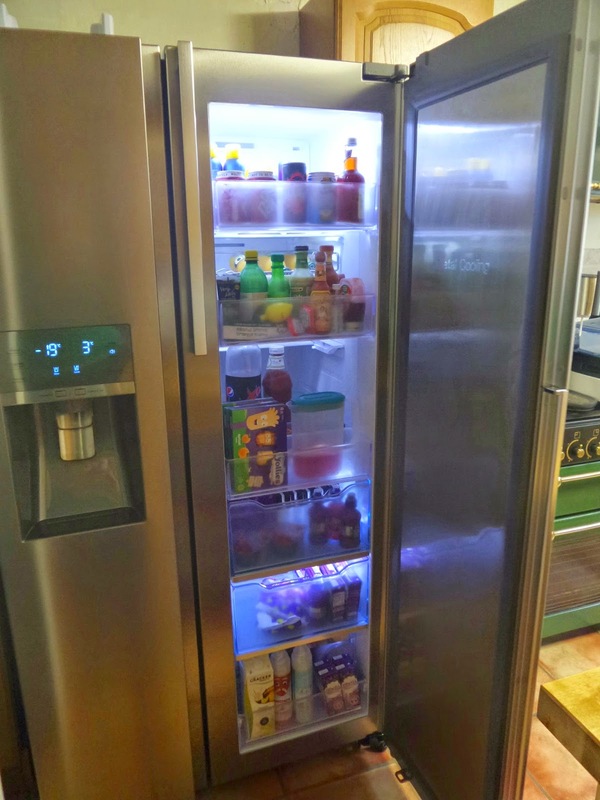 We looked at several, the ones I liked best were the ones that I'm convinced everybody in the USA has, the big double door fridge freezers, where if you are very lucky you can have a water and ice dispenser built in. 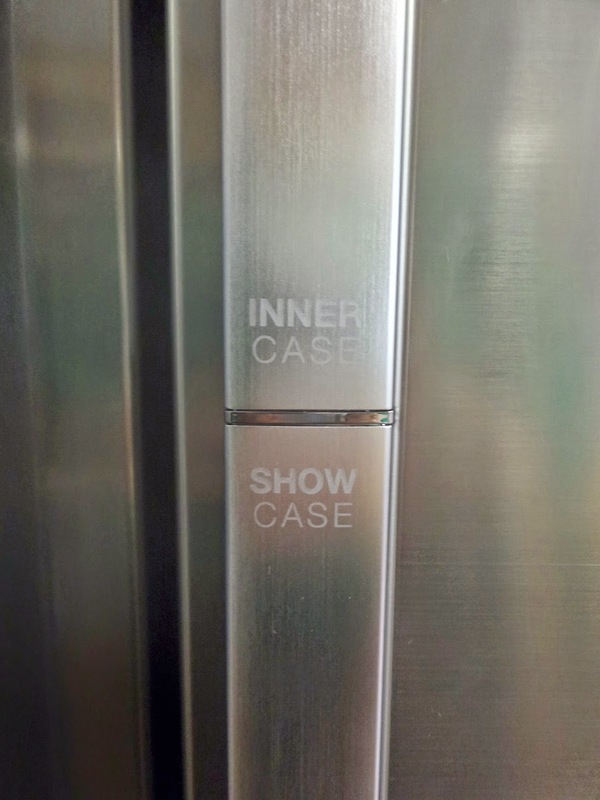 Plans were drawn up, by me to rearrange the kitchen into a layout that made sense for the way I work in the kitchen and we were just about to buy a fridge, when by pure luck, I was asked if I would like to review a Samsung Showcase Fridge Freezer. I loved how it was arranged to be delivered. 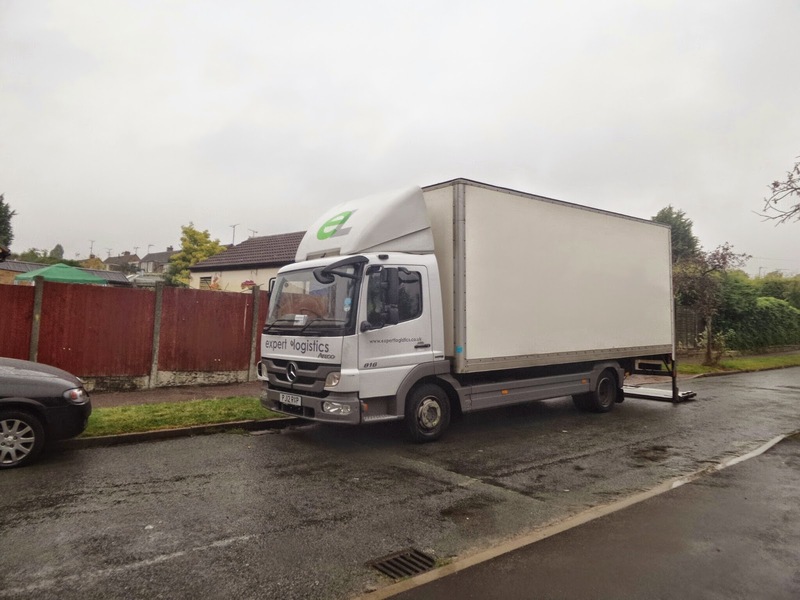 A chap phoned me up, asked me what day I'd like it delivered, including Weekends and Bank Holidays and then helped me work out the best route for the beast of a Fridge Freezer to get into the house. The layout of my house meant that it was going to be impossible to get it in through the front door, and instead the delivery team would need to come down the side of the house, carefully not scratch their fingers on the wall as they brought it between the house and the garage and then in through the back door, which they might have to possible remove from it's hinges. All I needed to do was arrange for a gas plumber to come and move my cooker and extractor fan out of the way. Oh and I needed to cut a section of work surface out so the fridge could fit into a gap. And that is almost exactly what happened. I cut the work surface up using a jigsaw, a plumber came and capped my gas oven so it could be moved the delivery men delivered, unboxed and were a bit grumpy because it was raining and not even 8am on a Bank Holiday Monday when they arrived. For some reason our extractor fan couldn't be unplugged from the wall, so Daddy twisted the extractor fan at an angle so the fridge freezer could fit in the house and then it was done. The fridge had been delivered and I christened it Sam. 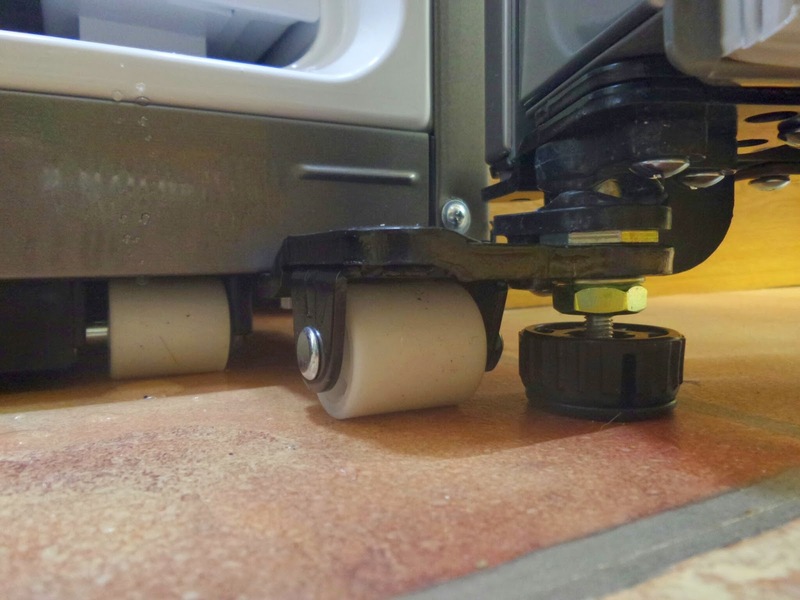 As it's on magic wheels (not the technical term and the plumber thought I was slightly odd for keeping saying they were magic wheels), it was easy to move from the middle of the kitchen into the gap I'd cut. Later on the day it arrived, Daddy took me to Ikea, mainly because I was being a pain and wanting to use the fridge before it was ready to be used. 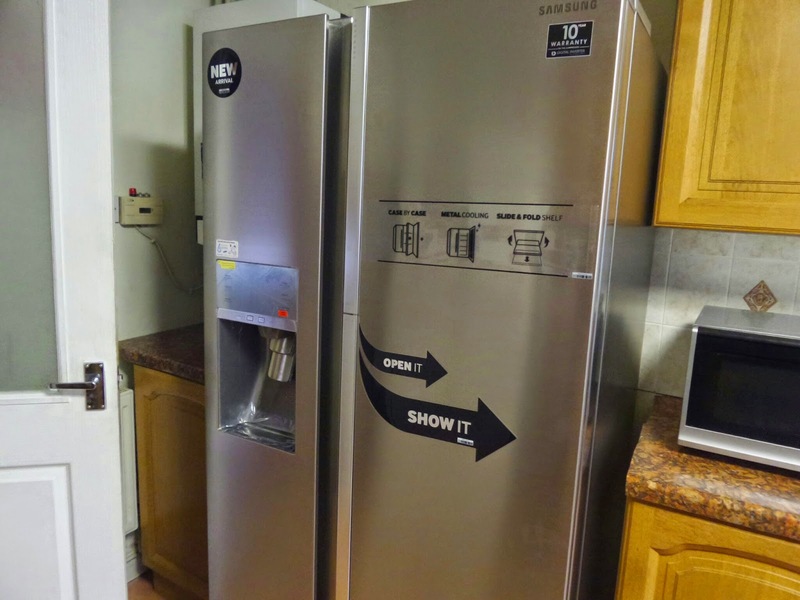 I've still no real idea on why a fridge needs to settle before it can be used, but Daddy, the delivery drivers, the lovely plumber all and the instructions all said it had to so I had to distract myself. 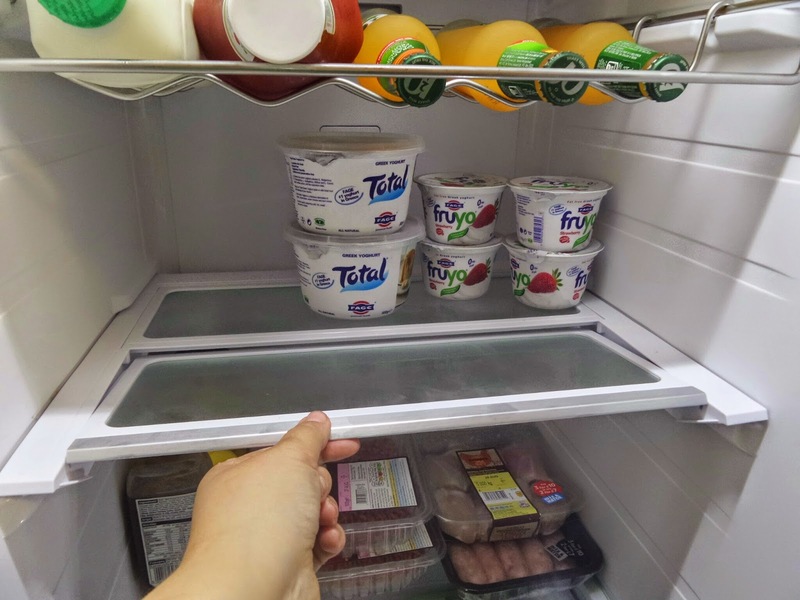 Whilst we were at Ikea, we purchased some new plastic storage containers, as we decided that what we wanted to do was to keep this fridge nice and clean and looking nice, so even whilst I was being distracted I kept thinking about it! Eventually we got back home and it was time to start using it. I LOVED IT, and may have posted a few tweets, facebook updates, instagram images and phoned several relatives to gloat speak of my love for the fridge. 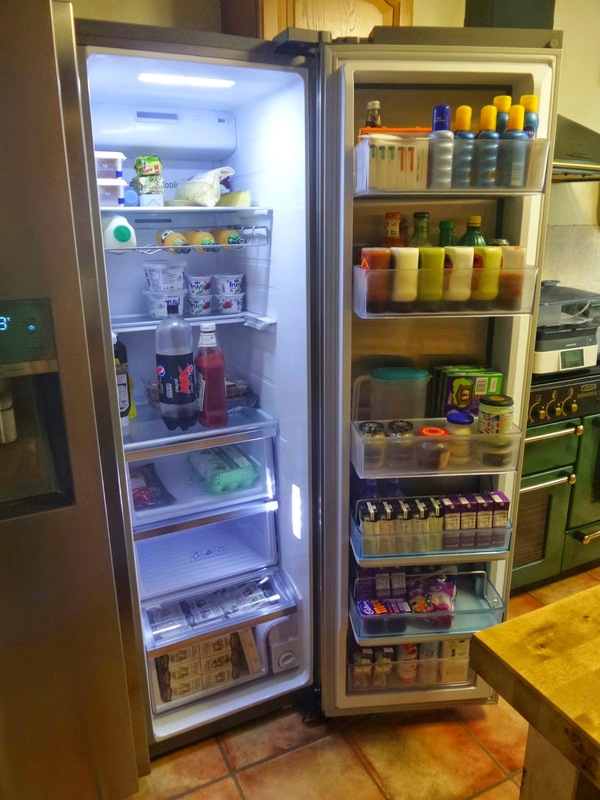 Having had it for a while, I have to say that I love the showcase aspect of the fridge, because everything I need on a regular basis is right there in the front of the door and it makes cooking so much easier, when I don't have to fiddle around looking at the back of shelves for various ingredients! 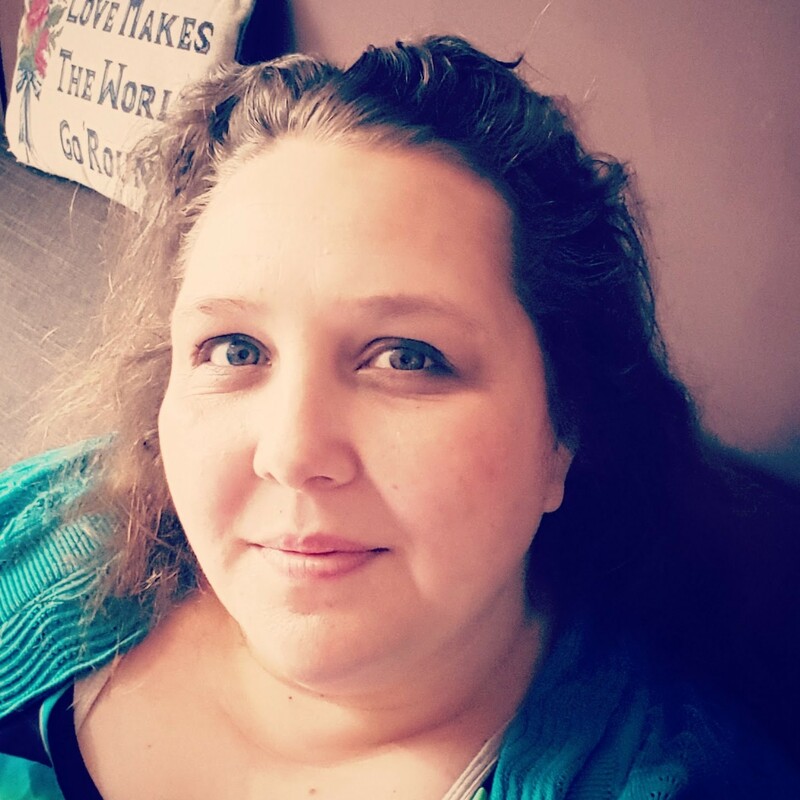 I'm pretty sure that the children love Sam for the same reason, as they get to go into the fridge and help themselves to the carb free items and drinks stored in the showcase door. I've found since we have had this fridge that food is kept fresher for longer, I'm sure this is something to do with the storage compartments and the all-around cooling, where cold air is blown out through multiple places at every shelf level to keep a constant temperature and of course the rather large drawers. 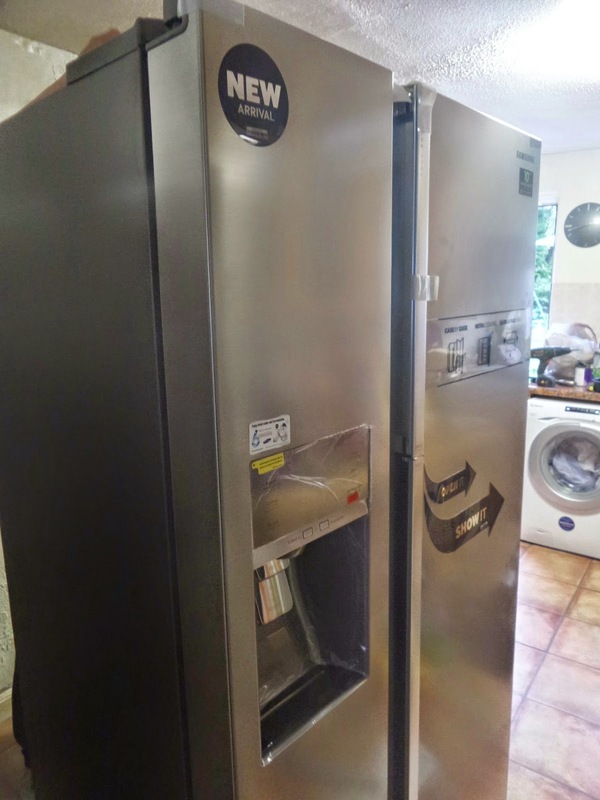 The chap who came to move my cooker (so the fridge would fit in the house) was impressed with the fridge freezer. 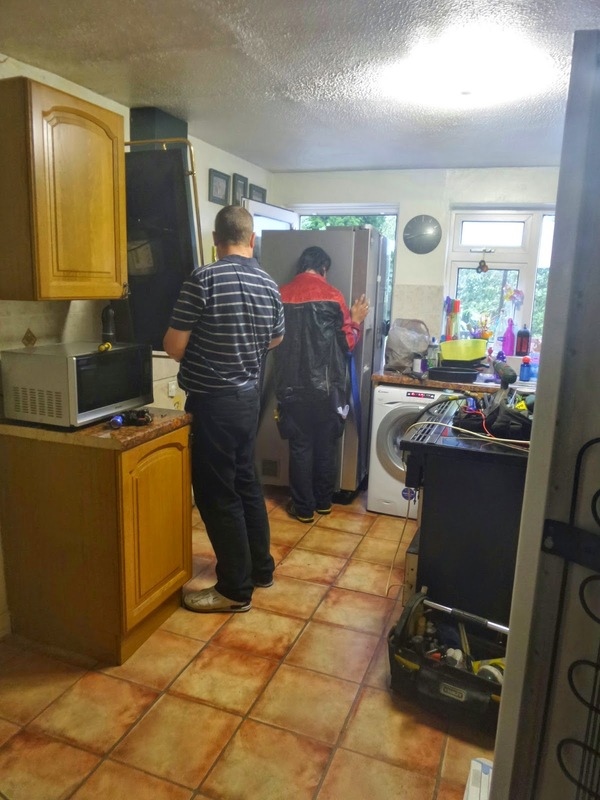 He gave us a few tips with regards to keeping finger prints from showing and plumbed in the water, so that we have ice and chilled water always available, which has pleased my Mum immensely because she loves a glass of chilled water. So. 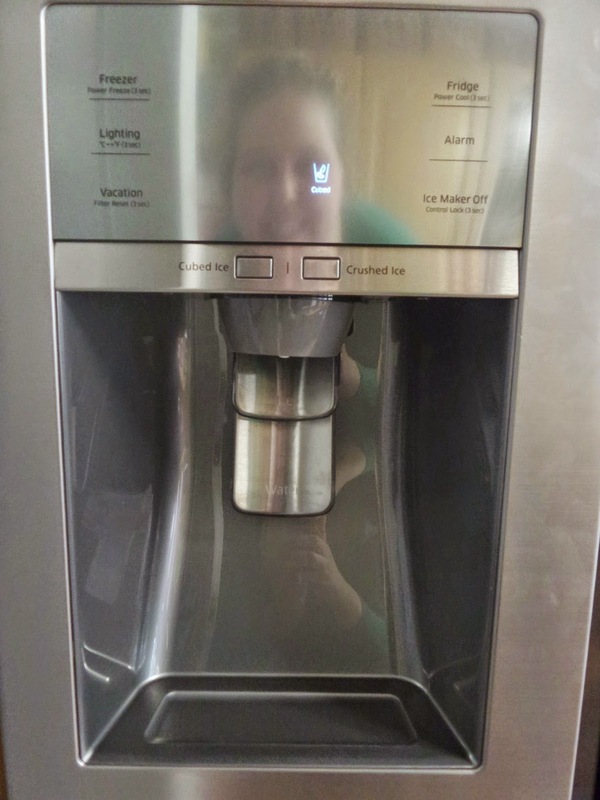 This is Sam, he's my bestie not just because he provides me with ice and chilled water but because he's rather useful, shiny, looks like he's from the future and makes me feel small because he's so tall and wide! 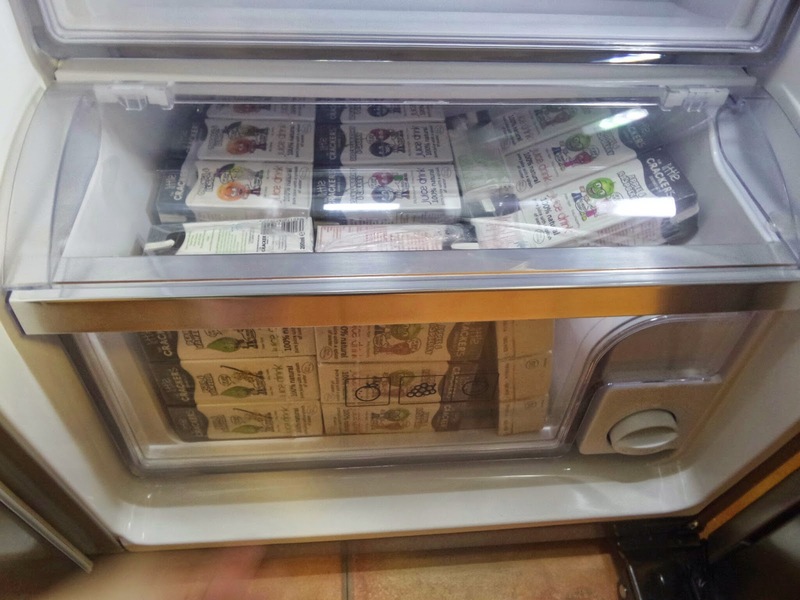 I was given the fridge, to review.